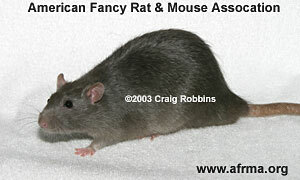 The following are the rat self colors as recognized by the American Fancy Rat and Mouse Association. These are one solid color (genetically black-based) with no white markings. 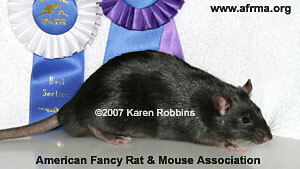 See Fancy Rat Genes: Black-based colors for genetics. See also the series of Rat Genetics articles. Color is to be even over the entire body, extending to the skin, and including the underparts, ears, feet and tail. General Self Faults – Faded or rusty color; mottling or shading of color; light underparts; white feet. General Self Disqualifications – White spot on the body; white on the tail. See the Standards book for additional details on each color. For complete details of these Standards including points, faults, and disqualifications, please refer to the AFRMA Show Regulations & Standards book. Note: The pictures on this page are not meant to be true representatives of the animal’s color. Because of differences in monitors (CRT/LCD) and how the monitor is adjusted, the colors may be different. Seeing in person is always best. BEIGE - Color is a warm grayish-tan, not too dark. Eye color is dark ruby. 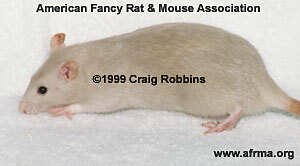 Beige rat owned and bred by Karen Robbins. Photo ©1999 Craig Robbins. BLACK - Color is a good solid black throughout, showing no rustiness or white hairs. Eye color is black. Black rat owned and bred by Mayumi Anderson. Photo ©2007 Karen Robbins. Read the article on “The Black Rat”. BLUE - Color is a slate blue, as dark as possible showing no brown patches or silvering. Eye color is dark ruby or black. 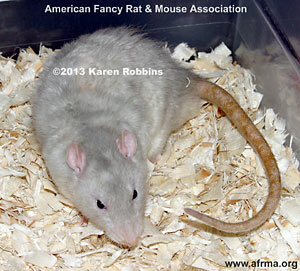 Blue Dumbo rat owned by Kimberly Millspaugh, bred by Michelle Grissett. Photo ©2011 Karen Robbins. BLUE-BEIGE - Color is a grayish-tan, not too dark, with a blue cast running throughout, not to be confused with Beige. Eye color is dark ruby. 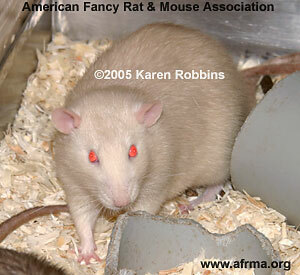 Blue-Beige rat owned and bred by Karen Robbins. Photo ©1995 Craig Robbins. Champagne rat owned and bred by Karen Robbins. Photo ©2005 Karen Robbins. 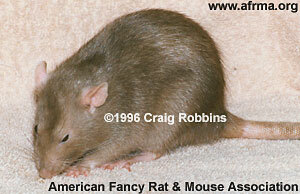 Chocolate rat owned and bred by Brian Shafer. Photo ©2008 Karen Robbins. Read the information on Chocolate. 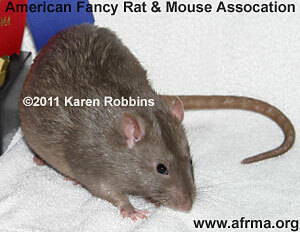 Cocoa rat owned and bred by Karen Robbins. Photo ©1996 Craig Robbins. LILAC - Color is a medium dove gray, evenly mixed with brown, not too dark. Eye color is ruby or black. 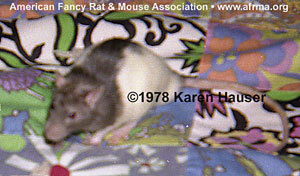 See photos from 1978 of original U.S.A. Lilac male Hershey and here, owned by Karen Hauser. Mink rat owned and bred by Mayumi Anderson. Photo ©2011 Karen Robbins. Read the article on “The Color Safir (Mink/Lilac)”. “Mink and Pearl: New Color Mutants in the Norway Rat” R. Robinson. Journal of Heredity, Volume 85, Issue 2, 1 March 1994, Pages 142–143. PINK-EYED PLATINUM - Color to be an off-white with a grayish cast, not too light (medium shade), not to be confused with Silver, Beige, or Champagne. Eye color is red. P.E. 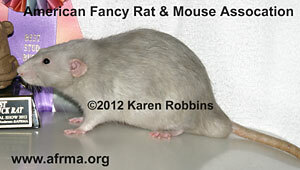 Platinum rat owned and bred by Jozzette & Mike Hagemann. Photo ©2013 Karen Robbins. PLATINUM - Color to be a light gray with no blue cast similar to platinum paint. Eye color is dark ruby or black. 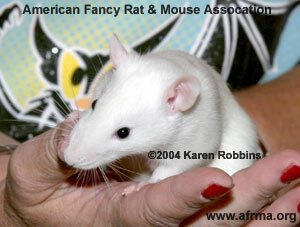 Platinum rat owned by Kimberly Millspaugh, bred by Michelle Grissett. Photo ©2012 Karen Robbins. POWDER BLUE - Color to be a very light powder blue color with no suggestion of rustiness, grayness, or silvering, not to be confused with Sky Blue. Eye color to be dark ruby or black. 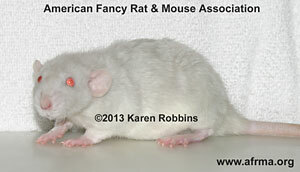 Powder Blue Rex rat owned and bred by Jozzette & Mike Hagemann. Photo ©2013 Karen Robbins. 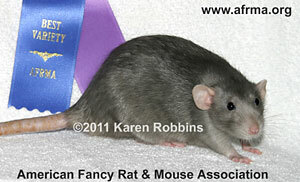 Russian Blue rat owned and bred by Karen Robbins. Photo ©2003 Craig Robbins. 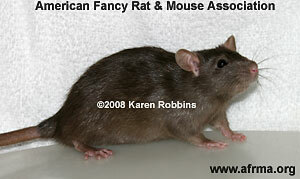 Read the article on “Russian Blue Rats”. “Shorter Articles and Discussion, Linkage Studies in the Rat” E. Roberts and J. H. Quisenberry. The American Naturalist, Vol. 70, No. 729 (Jul. - Aug., 1936), pp. 395–399. Russian Dove rat owned and bred by Jozzette Hagemann. Photo ©2016 Karen Robbins. SKY BLUE - Color to be in between blue and powder blue, a clear sparkling blue. Color showing no brown patches or silvering. Eye color to be dark ruby or black. 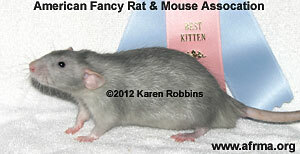 Sky Blue rat owned and bred by Jozzette Hagemann. Photo ©2012 Karen Robbins. 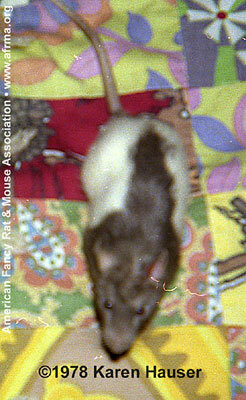 Black-Eyed White rat owned and bred by Cindy Maresic. Photo ©2004 Karen Robbins. PINK-EYED WHITE - Color is a pure clean white, free from ivory, cream, or beige tint. Eye color is red. 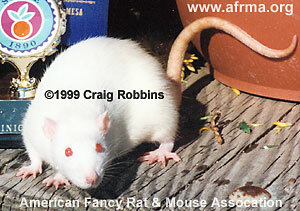 Pink-Eyed White rat owned and bred by Karen Robbins. Photo ©1999 Craig Robbins. 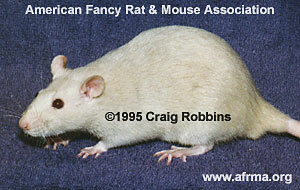 Read the article on “The Pink-Eyed White Rat”. “Linkage in Mice and Rats” L. C. Dunn. GENETICS, 5: 325 My 1920, 325–343. “Linkage Studies of the Rat (Rattus norvegicus) V” W. E. Castle. PROC. N. A. S., VOL. 27, 1941, 394–398. “Linkage in the Albino Chromosome of the Rat.” W. E. Castle. PROC. N. A. S., VOL. 32, 1946, 33–36. For complete details of the Standards including points, faults, eliminations, and disqualifications, please refer to the AFRMA Show Regulations & Standards book. 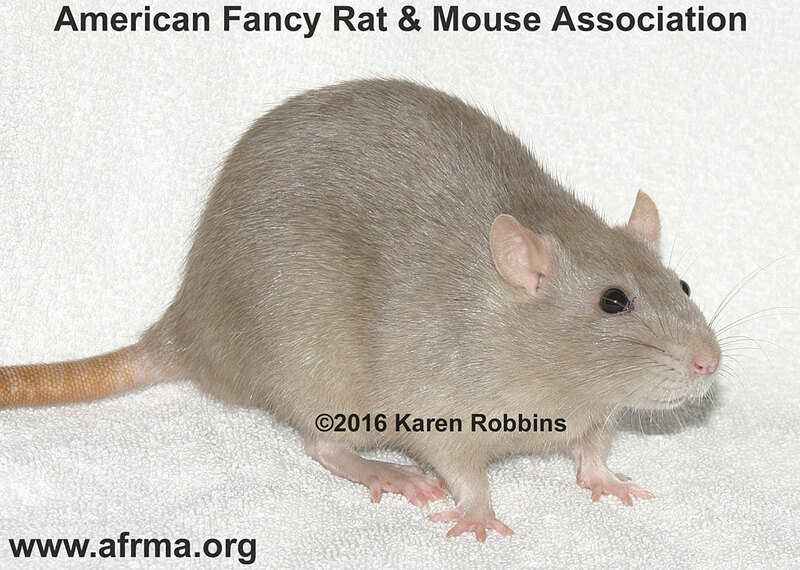 Purchase the AFRMA Official Color Standards Rat book.